The "Dancing House" is set on a property of great historical significance. Its site was the location of a house destroyed by the U.S. bombing of Prague in 1945. The plot and structure lay decrepit until 1960 when the area was cleared. The neighboring plot was co-owned by the family of Václav Havel who spent most of his life there. As early as 1986 (during the Communist era) V. Milunić, then a respected architect in the Czechoslovak milieu, conceived an idea for a project at the place and discussed it with his neighbour, the then little-known dissident Václav Havel. A few years later, during the Velvet Revolution Havel became a popular leader and was subsequently elected president of Czechoslovakia. Thanks to his authority the idea to develop the site grew. Havel eventually decided to have Milunić survey the site, hoping for it to become a cultural center, although this was not the result. The Dutch insurance company Nationale-Nederlanden (since 1991 ING Bank) agreed to sponsor the building of a house on site. The "superbank" chose Milunić as the lead designer and asked him to partner with another world-renowned architect to approach the process. The French architect Jean Nouvel turned down the idea because of the small square footage, but the well-known Canadian-American architect Frank Gehry accepted the invitation. Because of the bank's excellent financial state at the time, it was able to offer almost unlimited funding for the project. From their first meeting in 1992 in Geneva, Gehry and Milunić began to elaborate Milunić's original idea of a building consisting of two parts, static and dynamic ("yin and yang"), which were to symbolize the transition of Czechoslovakia from a communist regime to a parliamentary democracy. The style is known as deconstructivist ("new-baroque" to the designers) architecture due to its unusual shape. The "dancing" shape is supported by 99 concrete panels, each a different shape and dimension. On the top of the building is a large twisted structure of metal nicknamed Mary'. In the middle of a square of buildings from the eighteenth and nineteenth century, the Dancing House has two main parts. The first is a glass tower that narrows at half its height and is supported by curved pillars; the second runs parallel to the river and is characterized by undulating mouldings and unaligned windows. The famous dancers Fred Astair and Ginger Rogers are represented in the structure. A tower made of rock is used to represent Fred. This tower also includes a metal head. A tower made of glass is used to represent Ginger. This design was driven mainly by aesthetic considerations: aligned windows would make evident that the building has two more floors, although it is the same height as the two adjacent nineteenth century buildings. The windows have protruding frames, such as those of paintings, as the designer intended for them to have a three-dimensional effect. The winding mouldings on the façade also serve to confuse perspective and diminish contrast with the surrounding buildings. The general shape of the building is now featured on a gold 2,000 Czech koruna coin issued by the Czech National Bank. The coin completes a series called "Ten Centuries of Architecture". The Dancing House won Time Magazine's design contest in 1997. The Dancing House was also named one of the 5 most important buildings in the 1990's by Architekt Magazine. ^ Nationale-Nederlanden Building Frank O. Gehry, The Architect's Studio. Digital catalog of the Henry Art Gallery at arcspace. Archived. ^ 2018, FG Forrest, a.s., www.fg.cz,. "Dancing House (Tančící dům)". Prague.eu. Retrieved 2018-11-21. ^ a b Chroustovský, Jiří (Spring 2015). "Iconic Buildings" (PDF). SMART. ^ s.r.o., PTV Media. "Hotel opens in Dancing House | Prague TV - Living Like a Local!". prague.tv. Retrieved 2018-11-21. ^ "Ten centuries of architecture/'Present day – Dancing House in Prague'". Czech National Bank. Retrieved 27 July 2012. 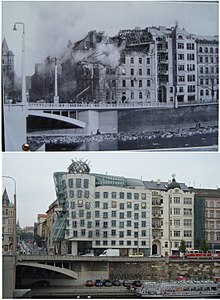 Wikimedia Commons has media related to Dancing House. This page was last edited on 8 April 2019, at 15:33 (UTC).